Frankfurt is a city in Germany. It is the location where most of the Club Nintendo story "Sag niemals Holerö!" takes place. Mario and his friends TicToc and Bomberman got there by train. They were searching for the Taj Mahal and found by accident that it is an Indian restaurant in Frankfurt. In the Taj Mahal, the friends would find out important information about KKDU, an evil alien attempting to invade Earth and transform all humans into food. Mario and his friends stumbled across Mahgo in the restaurant who told them about secret powers each of them had. 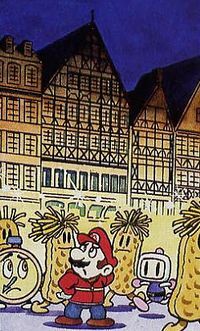 At the time of the story taking place, KKDU (in its human pop singer disguise called "Heini") was doing a concert at the Alte Oper in Frankfurt and Mario and his friends went there in order to stop the alien. Using their secret powers, they finally managed to defeat KKDU and its accomplices. This page was last edited on March 26, 2018, at 06:57.